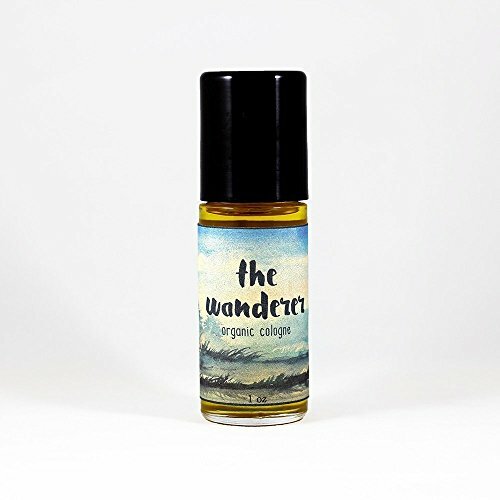 The Wanderer - Organic Cologne - Vegan Cologne by Eldridge Organics at Nicky's Blog. Hurry! Limited time offer. Offer valid only while supplies last. Woodsy, herbaceous, earthy and smoky. This blend encapsulates all the things that I love most about the great outdoors. It provokes my wanderlust. Woodsy, herbaceous, earthy and smoky. This blend encapsulates all the things that I love most about the great outdoors. It provokes my wanderlust. Makes me want to pack up my camping gear and disappear into the wilderness for a few weeks. Organic jojoba oil acts as the base for this cologne, which, thanks to its similarity to the natural sebum that we produce, is readily absorbed into the skin, leaving behind an alluring blend of organic basil, rosemary, vetiver, fir needle, and spearmint essential oils. Perfect for those who spend more time outside than in, or those who spend more time inside than out and wish that wasn't so. Packaged in a 1 oz recyclable glass roll-top bottle with a compostable label, and shipped in recycled, recyclable packaging so you can feel good about what's inside AND outside your product. If you have any questions about this product by Eldridge Organics, contact us by completing and submitting the form below. If you are looking for a specif part number, please include it with your message.